HOUSTON (KTRK) -- The story of an accident president and a nation's painful struggle over racism and civil rights collide in Alley Theatre's new co-production of "All the Way." With relevancy and rich characterization, the larger-than-life history of President Lyndon Baines Johnson is juxtaposed with the grim, heart-wrenching realities of prejudice and violence faced by African Americans in the 1960's south. Staged in partnership with the Dallas Theater Center, Robert Schenkkan's 2014 Tony Award-winning play gives audiences an insider's view of Washington gridlock over the Civil Rights Act of 1964, and on the hearts and minds of the central political and civil rights leaders of that era. 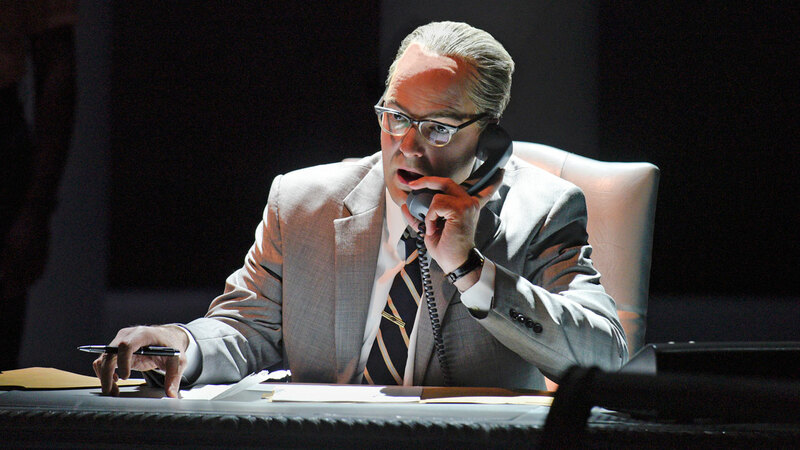 The play opens on LBJ in the moments after the assassination of John F. Kennedy, and the tailspin that ensues as he works to preserve his slain predecessor's legacy and solidify his own. Johnson, faced with a war on three fronts over civil rights, his own election and the growing burdens of Vietnam, must find a way to juggle battling factions and internal frustrations as the nation inches closer to November. Director Kevin Moriarty's fingerprints are felt throughout this incredible production, as scenes blend seamlessly together on the Alley's minimalist stage. Brandon Potter possesses the raucous character and quick wit of LBJ with precision, while giving him a vulnerability seldom seen by ordinary Americans. Potter channels the Texas president's southern drawl and intimidating presence with great command. Shawn Hamilton, however, delivers the production's most solid performance as he inhabits the space of moral and civil rights leader Martin Luther King, Jr. Hamilton masterfully conveys King's heart, his passion and the exhaustion of a man stretched between his own people as he works to deliver a victory for southern blacks. Hamilton shines and will tug at your heartstrings until curtain call. Noteworthy performances by Kiernan Connolly, who portrays FBI director J. Edgar Hoover with both humor and gravitas, and Adam A. Anderson as Stokley Carmichael, whose anger and heartbreak moved me to tears. Carmichael's speech before a Mississippi congregation is one of the standout moments from a decidedly rich production. "All the Way" runs through February 21 at the Alley Theatre, 615 Texas Avenue in Houston. Contains adult language not suitable for younger audiences.